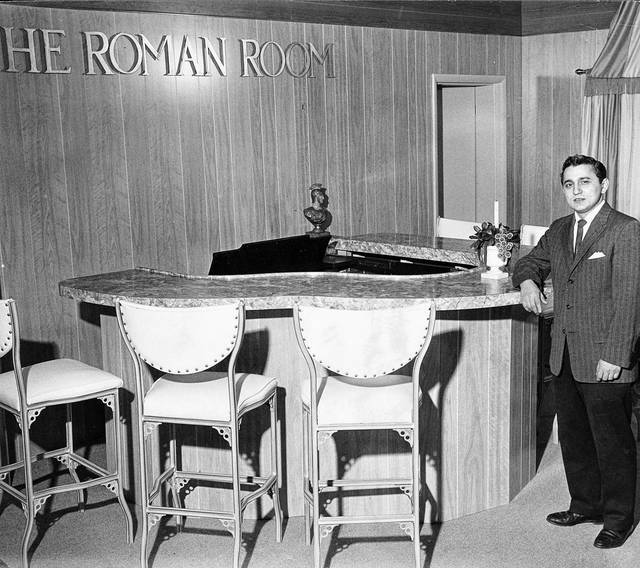 Frank Guagenti poses for an undated photo at the piano bar at Luigi’s Restaurant. 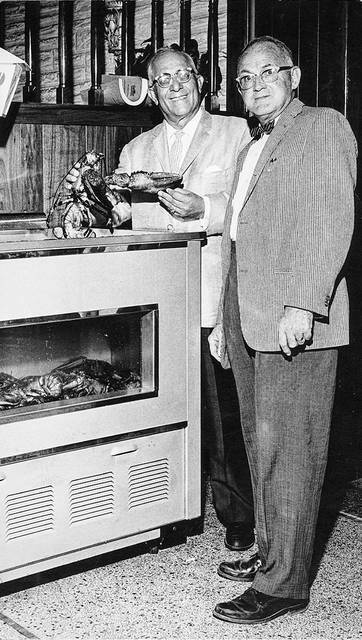 This 1963 photo shows a lobster tank at a restaurant. 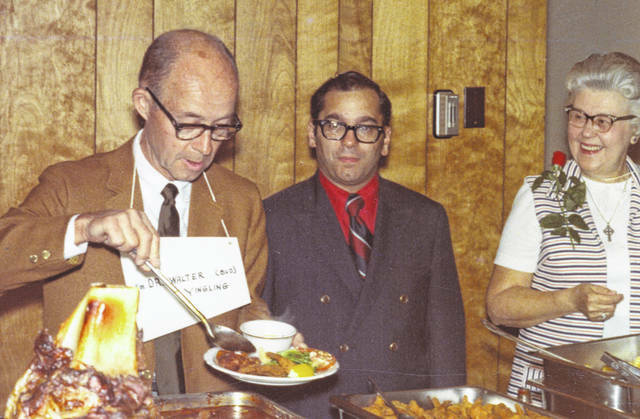 Bud Yingling, Little Joe Guagenti and Ruby Yant enjoy a buffet in this undated photo. Guagentis gather in this 1960 photo to discuss restaurant business. LIMA — On Dec. 8, 1967, Gena (Guagenti) Mongelluzzo sat down with Lima News columnist Hope Strong to talk about the Guagenti family, which, necessarily, involved a lot of talking. Since Gena’s father, Frank Guagenti, first set foot in Lima in the early 1930s, the extended Guagenti family, which includes Guagentis, Azzarellos, Venturellas and Cecalas, has grown and woven itself into the city’s fabric. They have been involved in many Lima restaurants — mostly Italian and most prominently the Milano Club — and other businesses ranging from car washes to carry-outs as well as numerous local charitable endeavors. It all began in the town of Caccamo near Palermo, Sicily, with Joseph “Giuseppe” Guagenti and his wife, the former Vincenza “Virginia” Venturella. The couple’s oldest son, Frank, was born in 1900, followed two years later by Giuseppe (Joseph), and two years after that by Louis. A fourth son, George, was born in 1905 before the couple welcomed daughters Concetta and Nicolena into the world. “During World War I, Frank served in the Italian Army, immigrating to Chicago after the war where he had several uncles,” Strong wrote. “Dad’s family had lots of property in Sicily but no money. He worked in the steel mills near Chicago then began a shoe repair business later opening a men’s clothing store,” Gena Mongelluzzo told the columnist. She was one of three children of Frank and Virginia Macaluso Guagenti. The other children were sons Dominic “Donnie” Guagenti and Joseph F. Guagenti. Frank eventually sent for his brothers who also worked in the Chicago area. The two older brothers, Frank and Joe, eventually moved to Oklahoma City while the two younger brothers, Louis and George, moved to Cleveland, Strong wrote, noting that all four operated restaurants and taverns. By the end of the 1930s, all four brothers lived in Lima. And, at least according to The Lima News of Aug. 8, 1932, a little shady business as well. Under the headline “Italian Near Death After Pistol Battle,” the News on Aug. 8, 1932, wrote: “War on liquor racketeering, speakeasies and gangland battles was declared Monday by Sheriff Jess L. Sarber following Allen County’s first gang shooting which occurred shortly before 10 o’clock Sunday night at the intersection of East Kibby Street and Bellefontaine Road, just outside the city limits at an alleged speakeasy known as the Homestead.” In October 1933, Sarber was shot and killed by gangster Harry Pierpont as he freed gang leader John Dillinger from the Allen County Jail. Joe Guagenti, according to the News, was “mortally wounded” in the shootout at the Homestead while his brother, Frank, was slightly wounded. The men on the other side, Art Miller and Steve Butoric, were not wounded in the shootout, which reportedly grew out of a disagreement about illegal liquor territories. Whatever the reason, the “barking of gangland guns,” as the News described it, left Lima on edge. The following day, Aug. 9, 1932, the News, raising the specter of more gun battles, reported the “gang factions” were “quietly reinforcing and ‘heeling’ mobs for any contingency.” But, on Aug. 10, 1932, both Frank Guagenti and Earl Smith, described as the “boss of county liquor,” assured the public there was no gang war. Joe Guagenti, “alias Joe Colla,” according to the News, eventually recovered. Attempts by a county grand jury to investigate the incident went nowhere and no one was ever tried. Despite that long-ago incident, Frank and Joe Guagenti are known today only for their decision in 1932 to open a four-table diner in the 100 block of East Wayne Street called the Milano Café. In 1934, the Milano was moved around the corner to the 400 block of North Main Street where it stayed and grew for 36 years. In 1960, the restaurant moved into the former Lima Club in the 400 block of West Market Street. It remained at that site, improved and enlarged several times, until a devastating fire in 1996. Today, the Milano Café is located on Elida Road. Guagenti and Azzarello, according to a Nov. 18, 2009, story in the News, “enlarged the dance floor, added ‘Italian spaghetti’ to the menu, and worked on changing the atmosphere.” They also changed the name to Alpine Village. Louis Guagenti also was involved in the Alpine operation. 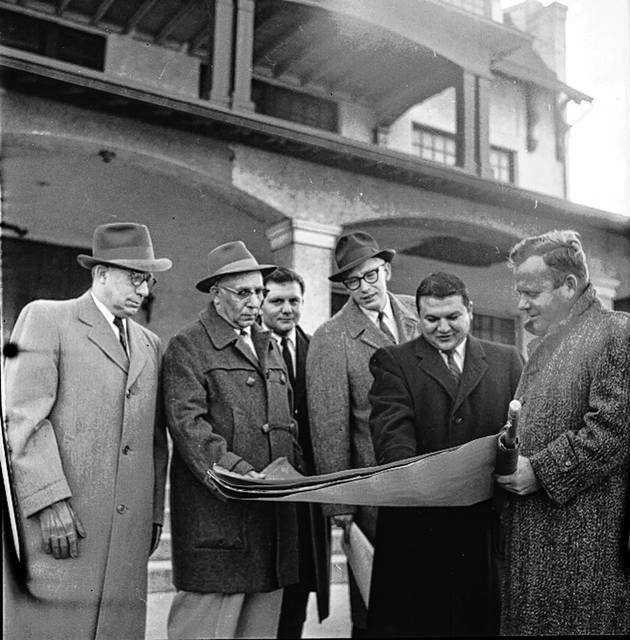 In 1961, Louis Guagenti and Joseph Azzarello spent $70,000 remodeling the old Roberts family homestead on South Leonard Avenue and opened it as Luigi’s Restaurant. The Lima Citizen on April 25, 1961, declared the renovations “brought out the natural charm of the two-story brick structure,” which at that time had stood on the site for at least a century. Yet another Frank Guagenti, this one a cousin of Frank, Joe, Louis and George who had lived in Buffalo, came to Lima and opened Frank’s Carry out on Findlay Road. Members of the family also were involved with the old Villa Restaurant on North Main Street and a club called the Warehouse, which also was on North Main Street. Family members own, among other enterprises, the Casa Lu Al restaurant on North West Street Road and Tudor’s on Elida Road. Joe Guagenti opened a short-lived restaurant called the Capri in the 100 block of East High Street in the 1930s. George Guagenti died in 1957, followed nine years later by his brother Joseph. Frank and Louis died within four months of each other in 1971.